So, once more into a brave new world at Tottenham Hotspur as the reign of yet another gifted young manager begins. As with every newcomer at White Hart Lane, Mauricio Pochettino’s mission is to succeed where every other Spurs manager has failed: to turn the club into Champions League regulars. His goal is not just to finish in the top four this season, but to finish in the top four every season. While he is doing this, he will be expected to revolutionise the club’s youth system in the same way that he did Espanyol’s, show the same faith in the players produced that he did at Southampton and turn what is a relatively disparate group of players into a tight unit. It would be a tall order under most chairmen – under Daniel Levy, whose finger is perpetually twitching on the trigger, the task appears almost impossible. That said, Pochettino will probably be the first Spurs manager in a long while to be allowed time. Levy’s bloodthirstiness is costing him allies left, right and centre in the stands and in the press and it appears unlikely that the people who matter will continue to allow him to sack managers whenever things go even slightly wrong. One more swing of the axe and the club’s reputation as a basket case will become too great for it to attract new managers and players. For Levy as much as anyone, this appointment has to be the right one. Thankfully, all the signs are good. Pochettino’s career so far has been one unblemished by failure and his methods have won him the public admiration of luminaries such as Sir Alex Ferguson, Pep Guardiola and Manuel Pellegrini. There are question marks over the flexibility of his tactical approach and over his capacity to deal with big-name players, but given the aptitude with which he has addressed every other challenge in his career to date, there is little reason to expect him to struggle in either of these departments. His biggest asset in righting those perceived wrongs will be the players already at the club. Tottenham can occasionally be accused of institutional hubris but there is no denying that the current squad includes fantastic individual talent, capable of overcoming tactical problems through pure footballing ability. The likes of Christian Eriksen, Sandro and Erik Lamela should be mainstays in this team and their undoubted ability maximised by a system that suits them down to the ground. If there is one aspect of Spurs’ play that will change, it is that the level of their pressing will intensify considerably. Like almost every top-level coach these days, Pochettino is a card-carrying Bielsista, hugely influenced by the teachings of the manager who gave him his start at both club and international level. Pochettino was a teenager when Marcelo Bielsa made him a mainstay in the legendary the early-nineties Newell’s Old Boys side, whose ferocious pressing took Argentina by storm, and later became a regular for Argentina under the man they call el Loco – the Crazy One. It is doubtful that any manager and player anywhere have had a better ‘teacher-pupil’ relationship, and the pupil has learned very well indeed. His sides’ pressing has been as good as any led by the master and it has been the basis of everything else on the pitch. For example, in 2013-14 no Premier League side averaged a higher possession figure than Southampton’s 58.6%. This was not because they were so good at keeping the ball that the opponent could not get it back, but because Southampton were so intent on winning it that the opponent never had a chance to settle and could not help but turn it over. The Saints’ pass completion average was a mediocre 81.4% but they made an absolutely heroic 21.2 tackles per game and 13.8 interceptions, pressing from the front in co-ordinated bursts that cornered players and left them with no passing options and no time to decide how to escape. Given the relentlessness of this approach, it is not surprising that they gave away 11.7 fouls per game, another high figure. The contrast between this approach and that of his predecessor could barely have been greater: Michael Caley found that Southampton’s opponents went from completing an average of 80% of their passes against Nigel Adkins’ Saints to 71% when faced with Pochettino’s. This compares well to both of Spurs’ managers in 2013-2014: 76% of opposition passes were completed under André Villas-Boas and 78% under Tim ‘Tactics’ Sherwood. With such vigour and commitment demanded in the defensive phase, the players can expect training to be more intense than under previous managers. 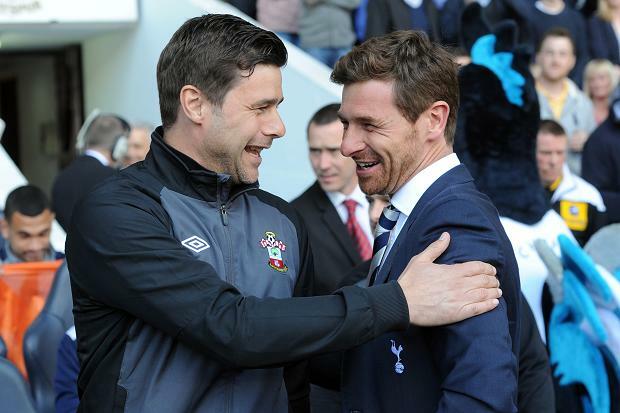 When Pochettino was at Espanyol, Dani Osvaldo said “he makes you work like a dog”, while Southampton’s Jack Cork said the step up in training made it seem that the players were expected to show the aerobic capacity of a man with two hearts. As would be expected in a system that looks to win the ball high up the pitch at every single opportunity, Pochettino’s favoured system of attack depends on fluid positional interchange between the four selected attackers and fast-paced, direct passing combinations to make the most of space behind the opposition defence. There is little point in expending all that energy winning the ball close to goal, with the defence out of position and totally unprotected, and then holding onto it for minutes at a time. The effectiveness of Southampton’s simultaneously defensive and attacking system showed in the statistics. Last season, only Manchester City conceded fewer shots per game than Southampton’s 9.6. The vast majority of the Saints’ goals were scored in open play (35) or from set-pieces (15) – the opposition found it so hard to get down to the other end of the pitch that counter-attacks were rarely necessary. Having won the ball in good areas, Southampton often tried the killer pass straight away: they attempted 23 crosses per game, the fifth highest number in the division, while only four teams attempted more balls in behind the opposition defence. Their directness is further illustrated by the fact that only Aston Villa played more than Southampton’s 70 long passes per game. This a product of three factors: 1) having a very high line, which gave the keeper no option but to go long, inflating the figure; 2) having centre-backs who were less than comfortable on the ball and no playmaker to take it from them and start moves; 3) having Rickie Lambert up front – to paraphrase José Mourinho, if you have a goalkeeper like Artur Boruc who puts the ball in the opponents' box, and a striker like Lambert who wins everything in the air, why play short? That is not to say their attacking play was direct to the point where it became Pulisian. They were similarly prolific at passing the ball on the floor as well. Only four sides played more than their 457 short passes per game. They were, in short, a near-perfect twenty-first century footballing unit: efficient in attack, relentlessly energetic without the ball and absolutely committed to the cause. If anyone doubts that the players will buy into his methods, it should be noted that his approach has benefitted his charges more than anyone else. If the likes of Adam Lallana, Jay Rodriguez and Rickie Lambert are now established England internationals, it is because of the work Pochettino has done with them. If Luke Shaw is now a £30m left-back, it is due to Pochettino teaching him how to play in that system and then giving them the chance to prove that he could. That is before we even get to José María Callejón, Vladimir Weiss and Philippe Coutinho, who caught the eye at Espanyol. Pochettino’s preference for young players comes from his commitment to this tactical approach. Firstly, they are physically fresher than players at the tail-end of their careers, and so find it easier to play with such ferocious intensity; secondly, they are keen to make an impression and consequently less likely to argue when the manager makes such outrageous demands of them. He has favoured youngsters right since his first steps in management. In 2011-12, his last full season at Espanyol but probably the first in which the squad could truly be said to be his own, 19 players made ten or more appearances – only six of them were over the age of 24. This bodes well for the likes of Tom Carroll, Nabil Bentaleb and Harry Kane, who should be looking to establish themselves after taking their first furtive steps in first-team football. Then there is the case of Erik Lamela. As well as being Tottenham’s record signing, he is also a 22-year-old kid of relatively low education in a city that could barely be any different to his hometown in Greater Buenos Aires. He is the sort of player that needs an arm round the shoulder and an understanding mentor to guide him through this long period of adaptation. As an Argentine who has moved to Europe and then to England, Pochettino can empathise with Lamela and be the avuncular figure he needs. It is easy to see where a player of Lamela’s type and quality fits into Pochettino’s plans and given that the manager is likely to be able to reassure him and help him settle off the pitch, it would not be a surprise if Lamela began producing his very best on it. It is hard to say whether the likes of Shaquile Coulthirst, Miloš Veljković and Souleymane Coulibaly can expect first-team opportunities to come their way. It will probably be a season or two too early for them. If they were charges of Pochettino’s at Espanyol or Southampton then they almost certainly would have made the cut, but the expectations at Tottenham are markedly different and he will have relatively sizeable transfer budget with which to pursue more experienced targets. In time, however, we can expect academy graduates to become regulars. The tactical problem for Pochettino’s Tottenham will be the same as it was for Spurs under Harry Redknapp, André Villas-Boas and Tim Sherwood. Teams will come to White Hart Lane aware of their preference for a high-tempo, proactive and vertical style of football and simply park the bus to secure an inevitable draw. If one side’s aim is to catch its opponents when they are coming forward, all the opponents have to do is refuse to come forward in the first place and the plan falls apart. There is also a question over resolve and the capacity of the system to respond to changing game-states. Southampton did not win a single game in which they went behind last season, only managing to secure a draw from losing positions six times. They also lost eight of the thirteen games in which the opposition opened the scoring. Worst of all, no team threw away more points from winning positions than Southampton’s 20. One thing that played into Pochettino’s hands was that many teams saw the name ‘Southampton’ and immediately thought this was a game they could and should be winning. Consequently, they attacked and played right into the system’s hands. Perhaps no game illustrated this better than when Arsenal visited St Mary’s in January, top of the table and looking to extend their lead. They came out of the traps looking to steamroller the Saints and instead found themselves utterly pummelled. They somehow escaped with a draw but it was the first misstep in their title challenge and a harbinger of things to come. Things will, of course, be very different for Pochettino at Tottenham. An established member of the top seven in the Premier League, teams of all levels arrive at White Hart Lane not confident of taking three points but primarily hoping not to lose. Pochettino will have to do what André Villas-Boas did not, and evolve the system so that the players can find ways to break down the most unambitious of defences. It may be tough going at first, and depending on the fixture list early results could be as frustrating as ever, but as previously stated, there is little reason to think that Pochettino cannot get it right in the long-term. When one considers that Tottenham’s third-band could consist of Erik Lamela, Christian Eriksen and Lewis Holtby, it becomes obvious that creativity should not be hard to come by. All three are magicians with the ball at their feet and intelligent users of space without it. In games where they only need to find one goal, Spurs should be more likely to do it now than at any time in recent memory. What Would A Pochettino First XI Look Like? It is obviously foolhardy to try and predict the starting eleven for next season when the summer transfer window has yet to open, but there are consistencies in Pochettino’s team selection that give a good hint as to what we can expect. I have therefore picked what I believe to be the XI that Pochettino would pick with the players currently at the club. It is more or less the same 4-2-3-1 formation and assignment of roles favoured by André Villas-Boas, with a greater emphasis on tempo and positional interchange. Hugo Lloris is obviously a perfect fit for the system, just as he was under AVB, sweeping up behind the defence while it is high up the pitch. Lloris was often hung out to dry under Tim Sherwood and seemed particularly agitated towards the end of the season, but we can expect Pochettino to get the best out of him once again. As with most managers at this level, Pochettino expects his full-backs to be extremely energetic, making powerful surges with the ball and looking to supply the forwards whenever possible as well as being positionally sound and aggressive without the ball. This suits Kyle Walker down to the ground but there remains a question mark over left-back. Benoît Assou-Ekotto would be a good fit in terms of his style of play but his lack of interest off the pitch would be a problem and he seems to have burned all of his bridges at the club anyway. Danny Rose has most of the tools but would have to improve his defensive game considerably to earn another run as first choice. In the centre of defence Pochettino prefers two players to act as uncomplicated stoppers. It can be a hard role to play in the high-pressing system: even though the two defensive midfielders are usually coached to screen very well indeed, the barrier can be bypassed and when it is there is not much else the players can rely on except their ability. In that respect, Jan Vertonghen and Vlad Chiriches are hardly lacking and will probably be the first choice partnership going into next season. In the second band, the double pivot’s job is to crush the opponent with a combination of physical might and relentless positional pressure. Morgan Schneiderlin was absolutely phenomenal at this job, regularly topping the Premier League’s charts for tackles and interceptions made, as well as passing the ball more often than any other Southampton player. In the second half of André Villas-Boas’ first season at Spurs, Sandro and Mousa Dembélé did as good a job, forming the division’s best double-pivot before injuries and new arrivals broke up their partnership. The third band is a very interesting prospect. In Erik Lamela, Christian Eriksen and Gylfi Sigurðsson, they have three players perfectly suited to the roles Pochettino prefers to use. Lamela and Eriksen can play as inside forwards, making runs off of the striker to exploit the channel between centre-back and full-back before using their undoubted finishing ability to fill their boots, as Jay Rodriguez did to great effect in 2013-14. Additionally, they are technically good enough and smart enough to combine and switch with Eriksen in the central attacking midfield position, from where they can do further damage and give defences more to think about. As far as plan Bs go, Aaron Lennon can play as a more orthodox winger should the system require change, Nacer Chadli can fill in for any absent attacker and Lewis Holtby, something of a forgotten man at White Hart Lane, can play in any role in the second or third band if circumstances demand a more creative deep option or another body in attacking areas to break down a stubborn defence. It seems unlikely that both Emmanuel Adebayor and Roberto Soldado will be at White Hart Lane next season but whichever remains – most likely the Spaniard – will find a perfect tactical environment for a predatory number nine with the guile to bring those around him into play. Harry Kane can expect to get more opportunities and to continue his impressive run at the tail of the season. Given such a wealth of options in attacking areas, it is difficult to see why Pochettino is reportedly pursuing Adam Lallana, who would cost around £25m in transfer fee from his former club. Several of the players in these areas will be going into second seasons at the club and could do with playing in a more stable environment more than anything else. It must be said that Pochettino’s record in the transfer market is average at best. At Espanyol the majority of his signings succumbed to midseason injuries again and again, while spending €6m on the hard-working but unproductive and perpetually relegated Sergio García was an error. At Southampton he broke the club’s transfer record to sign Dani Osvaldo, with whom he had worked in Catalonia, but the Argentine-Italian forward left after 13 games and three goals after punching Jose Fonte in training. With Technical Director Franco Baldini’s future at the club in serious doubt, it would therefore be very risky to give Pochettino total control of transfers. He has almost certainly been appointed solely for his strength on the training ground and to that end it would be better to keep things as they are, with Pochettino in the Head Coach role and Baldini in charge of the ins and outs – of which, if we are honest, Spurs do not need many. The priority must be to secure another left-back and perhaps a right-back to cover Walker and a striker to replace Adebayor or Soldado when they are moved on. Otherwise, it is a fairly straightforward job. Keep the players they currently have, mould them into a unit, instil a sense of unity and team spirit and see where it takes them. The ride is certain to be a bumpy one – bumpier still given that Daniel Levy will be in the background itching to load his gun – but now is a time for optimism. Almost all of the ingredients are there to make it the beginning of something special.